For nearly 5,000 years, people have practiced T’ai Chi as a way to prolong life, build strength and stamina, improve concentration, and achieve psychological balance. Hundreds of millions of satisfied customers can’t be wrong. Exercise is good for the body and soul. Now let Therese Iknoian and Manny Fuentes show you how to energize, find inner peace, and tone your muscles with the gentle art of T’ai Chi. Geraldine Woods is the author of more than 40 books, including the popular English Grammar For Dummies. She has taught high school and middle school English for over 25 years. Part I: Stepping Up to T'ai Chi. Part II: Preparing to T'ai One On. Part III: Knocking on T'ai Chi's Door. Part IV: Energizing Softly with Qigong. Part V: Making the Most of Your Practice. 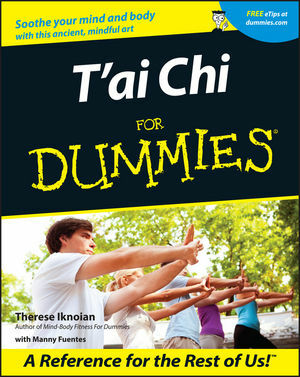 Chapter 1: Matching T'ai Chi's Mind-Body Benefits to Your Needs. Chapter 2: Evaluating T'ai Chi's Health Benefits with a Western Mind. Chapter 3: Building the Mind-Body Foundation. Chapter 4: Sowing Your T'ai Chi Seeds Mindfully. Chapter 5: Saying Hello to the Founding Families. Chapter 6: Scaling the Peaks of T'ai Chi Practice. Chapter 7: Internalizing the Principles. Chapter 8: Building the Basics. Chapter 9: Opening the Door, Yang-Style. Chapter 10: Keeping the Flow, Yang-Style. Chapter 11: Closing the Door, Yang-Style. Chapter 12: Trying Out Manny's Short Form. Chapter 13: Recognizing the T'ai Chi-Qigong Bond. Chapter 14: Meditating and Moving the Qigong Way. Chapter 15: Practicing What I Preach. Chapter 16: Living a T'ai Chi Lifestyle Every Day. Chapter 18: Taking a Moment for Qigong. Chapter 19: Combining Qigong and T'ai Chi. Chapter 20: Ten Benefits of Practicing T'ai Chi. Chapter 21: Ten Times and Places to Add a Little T'ai Chi to Your Life. Chapter 22: Ten (Plus One) Ways to Supplement Your T'ai Chi Practice. Chapter 23: Ten Things to Tell Yourself about Your Practice. Chapter 24: Ten Wise Taoist Lessons. Chapter 25: Ten Quotes to Live By.